Photograph of Tony Davis from ABC Great Southern, 27th November 2015. One of the great pleasures I’ve had since starting this project several years ago is meeting Tony Davis from Albany. In 2016, I was working very closely with my close friend Michael Liu on a Revel Cooper project. Revel was one of the Carrolup child artists and it was through this project I eventually decided to focus on the Carrolup Story. Michael and I were to attend the Bella Kelly Retrospective at John Curtin Gallery, Curtin University, Perth in June 2016. We decided we had to corner the exhibition curator Annette Davis along with local Bella Kelly expert Tony Davis – no, they are not related. We achieved our aim and the four of us agreed to meet in Narrogin when the Bella Kelly Retrospective opened there in September. In Narrogin, we had some very interesting discussions and Mike filmed both Tony and Annette. Since then, my partner Linda and I have twice visited Tony in Albany. John and I spent a few days with Tony late last year. Each of our visits has been delightful. Over the time we have known each other, Tony and I have spent a great amount of time discussing our respective projects. He asked me if I would read and edit the book he is writing (see below for book details) and that was the most fascinating experience. I’ve not previously met anyone who knows so much history about the Great Southern and South Coast regions of Western Australia, both from an Aboriginal and non-Aboriginal perspective. Tony has lived, worked and played with Noongar people and many of those people have told him stories about their lives and the lives of other Noongar people. In my humble opinion, Tony is the Sherlock Holmes of the region. We have spent many hours piecing together bits of history, particularly around Carrolup and the Carrolup children. For me, it’s been a great privilege. And I was absolutely thrilled when I could bring two friends – Tony and John Stanton – together late last year. My only ‘fear’ in befriending Tony and exchanging so much information is that our projects are getting bigger and bigger… and bigger. But as Tony has said so many times to me: so many people (Aboriginal and non-Aboriginal people) want to know these stories, and if we don’t ensure our content ‘gets out there’ it’s possible that stories will disappear or be changed to versions that are not correct. Tony, thanks for your friendship, knowledge and inspiration! And thank you for agreeing to be an Advisor on our Carrolup film project. Here’s a short bio of Tony and a link to a piece of video introducing him and his relationship with the matriarch of Noongar art, Bella Kelly. 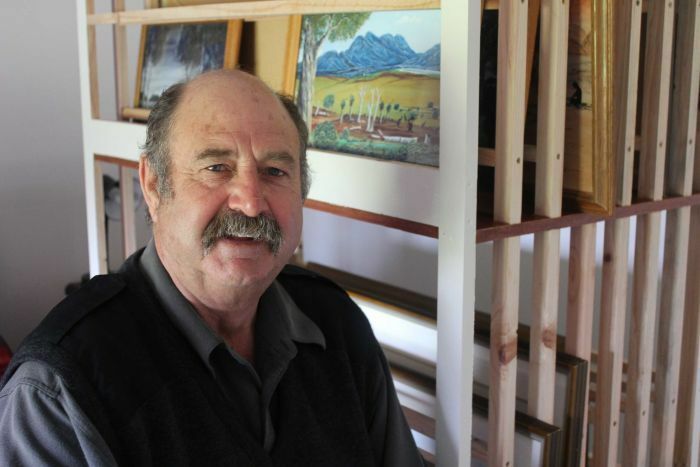 Tony Davis spent over thirty years researching the life of Aboriginal artist Bella Kelly. Here, he describes the story behind the special gift he received from Bella, whilst we view this beautiful painting. Filmed and edited by Michael Liu, September 2016.